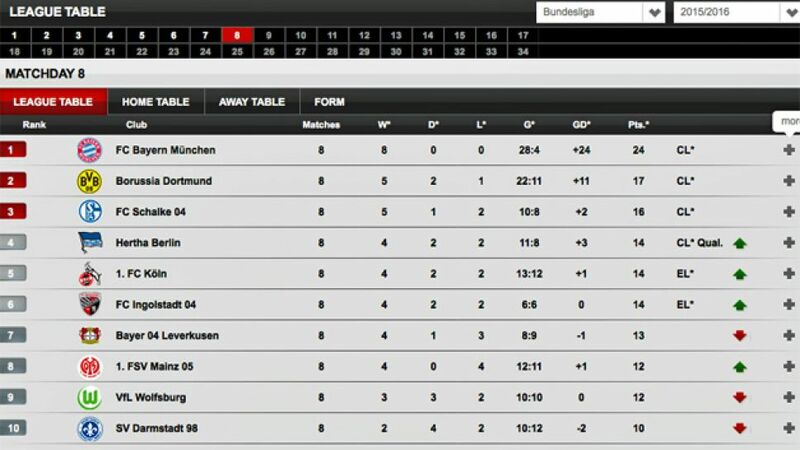 Bundesliga | New interactive tables online now! New interactive tables online now! Cologne - bundesliga.com has revamped its Bundesliga and Bundesliga 2 to provide you at home with a wealth of added statistical gold. For starters, you will notice a form chart plotting each club’s league position of the season so far. Red marks their lowest ebb and green their peak. Then, if you hover over each juncture, you will be able to find out the club’s opponent and subsequent result on the matchday in question. Another new feature of the tables page allows you to click directly on the club’s name or logo. In doing so, you will be redirected to the club’s individual page, where you can access areas such as club news, club data, squad profiles, results and stadium and ticket info. If you would prefer to skip straight to the club’s results page, you also have the option of being able to click directly on either the number under ‘matches’ or ‘Pts’. Once there, simply navigate our in-depth matchday analysis until your heart is content. If leading goalscorers are more your cup of tea, simply click on either the number of goals for, goals against or goal difference to reveal the Bundesliga/ Bundesliga 2 scoring charts courtesy of the player statistics page, where you can also discover which players have chipped in with the most assists. Finally, the wins, draws and defeats columns are well worth a click if you want to learn more about a club’s historical and current highs and lows.